Also available at Art Accelerated‘s new art gallery, 1906 Third Street, Tillamook, Oregon. “What to say about the miracle that is this little book? The author, Neal Lemery, has written a small masterpiece. This collection of short, powerful pieces moved this reader to tears again and again. “Homegrown Tomatoes” has the power to move all readers to new ways of speaking, listening and taking action in our own backyards and communities, as healers and peacemakers. “Something of a soul brother to the philosopher/writer and mystic gardener, Rudolf Steiner (founder of the Waldorf school movement and of “biodynamic” gardening) Neal Lemery believes in the inherent goodness and limitless potential of each human he meets. He believes in the power of education and sees that Nature can be our wisest, most gentle teacher and healer. “Lemery’s essays, like the parables of Jesus, are grounded in the most “ordinary” of human experiences: observations of plants and of birds, moments of kindness offered to those who have been marginalized in society, zen-like questions about what we truly value and where we show up with compassion for others. “The most powerful essays are those where Judge Lemery lets us enter his “secret garden” at the OYA. We are privileged to be there with him as he meets the young men incarcerated for juvenile offenses, some of them serving long years in prison. “We’re there as Neal cooks, listens, plays cards, gardens, laughs and cries with these young men. What obstacles they have overcome despite their failures! We are allowed to share his sorrow at how much betrayal and suffering too many children endure. We are privileged to witness how seeds of Hope are still present even in the dark, cold winter soil of these lives that have known too much pain — just waiting for the warmth of kindness and rays of compassion to bring the spirit back to life. “Lemery’s essays inspire us to believe that we too can be transformed if we “tend our garden.” His poetry and prose reminds us that we can allow Life and Beauty to grow around and through our own hands, provided we sharpen and value our “garden tools” (our unique gifts) and this book has reminded me that the time to get started is always NOW. “Highly recommended for teens, teachers, counselors, parents, social workers, gardeners, poets and judges! Would make a great Christmas gift or selection for your Book Group for Spring 2017. 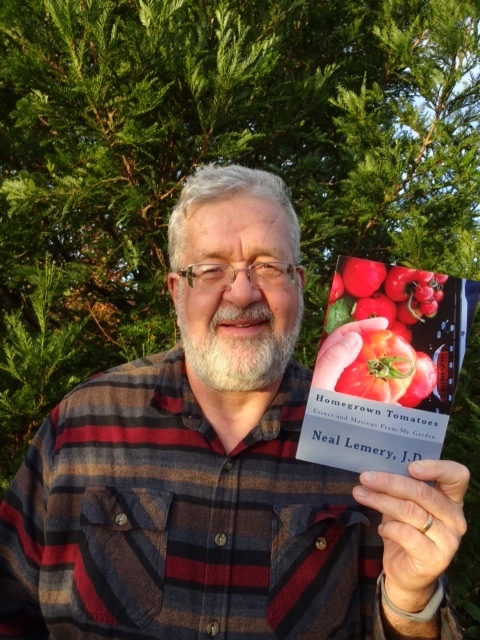 “A garden has countless lessons to teach, and in his second collection of essays set in the garden at the Tillamook County Oregon Youth Authority, Homegrown Tomatoes: Essays and Musings from my Garden, former judge Neal Lemery reflects upon what he’s learned in his volunteer capacity, teaching and toiling with the youth. Also included are lessons learned involving members of his community and his friends. Each essay in this collection deals with one of the “big” issues in life we all encounter, young or old. “The garden for Mr. Lemery and the incarcerated youth is more than a garden—it’s a metaphor for life in a general sense, and a place for everyone to be nourished, with wisdom, honor, and respect; a place for listening and conversing, questioning and finding answers, all while completing mundane chores such as weeding and washing dishes.